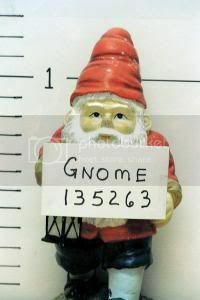 The gnomes were hidden in some underbrush with a banner that read, "gnome mistreated, gnome liberated", police said. A national garden gnome liberation operation was announced on the group's website in honor of the Nov. 1 French holiday, All Saint's Day. Last month 86 gnomes were found in the yard of a Limoges high school. Others, stolen last summer, were discovered along the edge of a swimming pool on the outskirts of the city. "Because of the heat wave, they wanted to get some air," read a letter that appeared in gnome owners' mailboxes. According to the group's website, the Front for the Liberation of Garden Gnomes (FLNJ) has about 100 active members throughout France, as well as in Canada, Germany, Spain, and the United States. One of the gnomes managed to get into mischief, however . . .